Lady Gaga, who is currently enjoying critical and commercial success for her debut movie A Star Is Born, was honored as one of ELLE's Women in Hollywood at an event in Los Angeles on Monday night. Wearing an oversized Marc Jacobs suit, Gaga gave a moving speech about women in show business and her personal struggles with fame and mental health. "I tried on dress after dress today getting ready for this event, one tight corset after another, one heel after another, a diamond, a feather, thousands of beaded fabrics and the most beautiful silks in the world," Gaga said. "To be honest, I felt sick to my stomach. And I asked myself: What does it really mean to be a woman in Hollywood? We are not just objects to entertain the world. We are not members of a giant beauty pageant meant to be pit against one another for the pleasure of the public. We, women in Hollywood, we are voices. We have deep thoughts and ideas and beliefs and values about the world and we have the power to speak and be heard and fight back when we are silenced." She continued: "So, after trying ten or so dresses, with a sad feeling in my heart, that all that would matter was what I wore to this red carpet, I saw an oversized Marc Jacobs suit buried quietly in the corner. I put it on to a resounding view of eyes glaring at me in confusion. 'But the Rodarte was so beautiful!' one said. 'But the Raf Simons for Calvin Klein was so stunning on you!said another. But what about the Brandon Maxwell? What about the Dior?' Lots of questions. They were all dresses. This was an oversized men’s suit made for a woman. Not a gown. And then I began to cry. In this suit, I felt like me today. In this suit, I felt the truth of who I am well up in my gut. And then wondering what I wanted to say tonight become very clear to me." 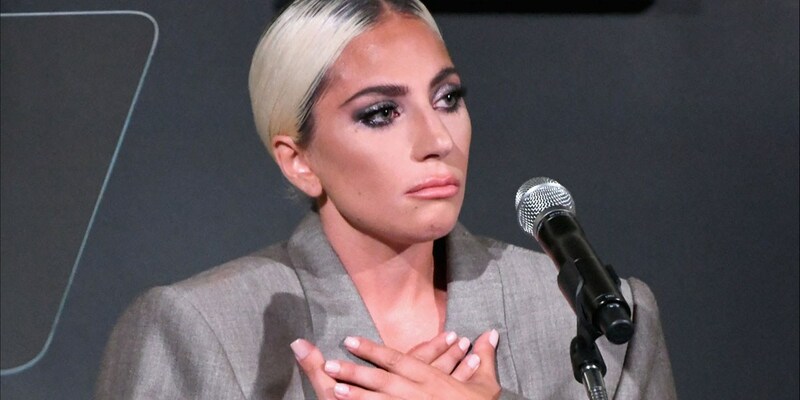 Gaga also opened up about her sexual assault and suffering from PTSD and chronic pain. "As a sexual assault survivor by someone in the entertainment industry, as a woman who is still not brave enough to say his name, as a woman who lives with chronic pain, as a woman who was conditioned at a very young age to listen to what men told me to do, I decided today I wanted to take the power back," she added. "Today I wear the pants." "After I was assaulted when I was 19 I changed forever. Part of me shut down for many years. I didn’t tell anyone. I avoided it myself. And felt shame even still today standing in front of you. I feel shame for what happened to me. I still have days where I feel like it was my fault. After I shared what happened to me with very powerful men in this industry, nobody helped me. No one offered my guidance or a helping hand to lead me to a place where I felt justice, they didn’t even point me in the direction of the mental health assistance I was in dire need of. Those men hid because they were afraid of losing their power. And because they hid, I began to hide. "I hid for a long time until I started to feel physical pain. Then I had to go to the doctor because I didn’t know what was wrong with me. And then I was diagnosed with PTSD and Fibromyalgia, which many people don't think is real, and I don't even know what the **** to say about that. But I’ll tell you what it is. It’s a syndrome that is essentially a cyclone of stress induced pain. And I really wish my friend Lena Dunham was here tonight because I think she could probably articulate this much better than me. And I hope we can all agree that she’s a remarkable woman."